You don't need a gym membership or even a dedicated workout space to be fit. 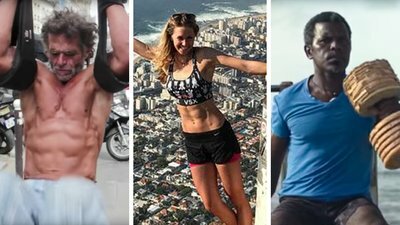 These unique individuals prove you can stay in shape anywhere, anytime! Soares lives and breathes fitness, and he wants his community to do the same. He dedicated countless hours to constructing a community gym on the beach in Santa Maria, Cape Verde, a nation situated on a volcanic archipelago off the northwest coast of Africa. If that doesn't sound impressive enough, he built everything, including the weights, by hand out of found materials. Soares collects debris along the coast of Santa Maria, both to keep his beloved beach clean, and to create a stunning display that makes physical health and fitness entirely accessible. In a brief video by Roger Serrasqueiro, Soares states, "I love to train, and Santa Maria lacked a place where the local community could exercise. A normal gym is just too expensive." Soares remains dedicated to continually improving the gym, not only for himself, but for his community. Jones, a blogger and flight attendant based out of London's Heathrow Airport, is devoted to getting fit and staying active all over the globe. Early in her career, Jones resolved not to let her job have a negative impact on her health and well-being. She knew that individuals in her profession often gain weight due to extreme fatigue. She counteracts the exhaustion by allowing her body to rest, rehydrate, and readjust after landing. A typical post-flight workout includes some mild cardio and light lifting, emphasizing the importance of not pushing her body when it's drained of energy. Post-recovery, Jones hits it hard with high-intensity interval training (HIIT), yoga, and weights 4-5 times a week. She is particularly fond of HIIT, since it requires little to no gym equipment, and can be done almost anywhere. To keep her workouts evolving, she often attends group sessions wherever she is, such as a Sweat 1000 class in Cape Town, South Africa, or a sunrise yoga class in Bali, Indonesia. She's also dedicated to helping others achieve optimal health and fitness through her fitness website The Lean Life, which is founded on the belief that leading an active lifestyle and consuming a diet of nutrient-rich foods results in a healthier, more energized self. Follow Jones on Instagram at theflyingfitfoodie for motivation to stay fit at home or abroad! Jacques Sayagh is a 53-year-old bodybuilder living on the streets of Paris. Without access to a gym, Sayagh stays buff via street workouts. In a short film by Julien Goudichaud, Sayagh recalls his former struggle with substance abuse, and his hope that his dedication to bodybuilding is something his grandchildren can admire. "I want them to be proud of me—that's all I want," he says. He's competed in several bodybuilding competitions, including the IFBB France. He attributes his ability to stay alive and healthy while homeless to his dedication to bodybuilding. Laura Johnson is a freelance writer based in Portland, Oregon.